In 2014 GlobeCore has implemented a project involving supply, installation and commissioning of an automated CMM-0.6A mobile plant. The unit is designed to remove solid particles and vacuum drying of transformer oil. The product’s viscosity must be below 70 cSt at 50 °С. Quality purification of transformer oil is facilitated by multiple passes of oil through a filter array and drying by applying vacuum and removing water vapor from the oil’s surface. The main point of the unit is complete automation. This plant is equipped with a GSM module, allowing the unit to be controlled from cell phone, controlling process parameters transmitted as text messages. Process automation eliminates down time and facilitates prompt emergency stop, if necessary, and also saves on labor costs. 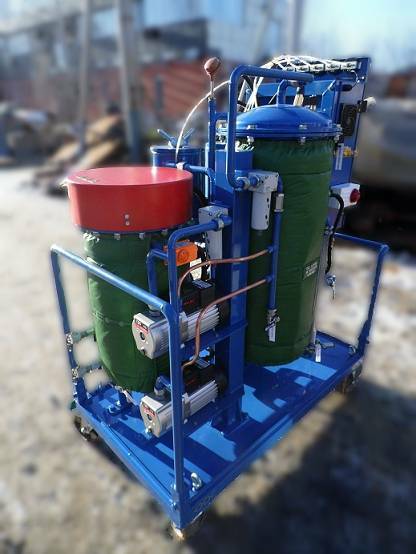 The mobile plant is intended for use by high voltage oil-filled equipment installation, repair and operation facilities.